Ambiente Blog • Tradition sets the table for new dishes. Newcomers to the tableware sector can struggle since it already boasts very many, very high quality products. Yet we’ve found some young ‘Dining Talents’ with a thirst for new design who are honouring tradition while speaking a more modern design language. The label Bisarro is named after its place of origin, Bisalhães, crossed with the Portuguese word for clay. 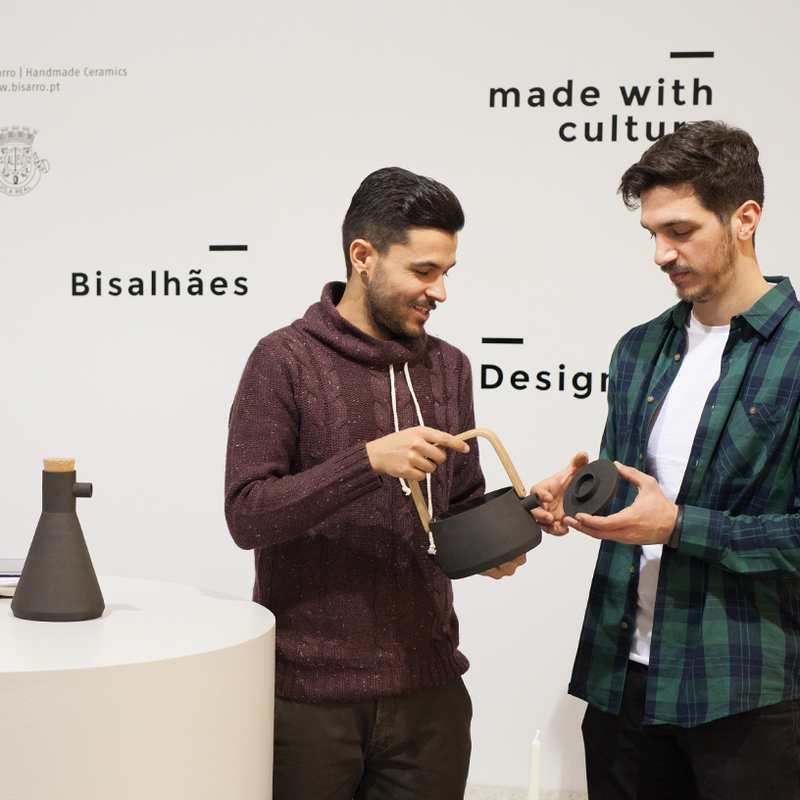 Its two founders first garnered years of experience in the ceramics industry, then decided to produce objects of their own, inspired by the Portuguese ceramic tradition. What’s striking about this traditional method is the red clay that is fired to black ceramics in semi-underground earth kilns. Bisarro’s founders Daniel Pera (left) and Renato Rio Costa. Bisarro’s intervention came just in the nick of time: there are now only 4 or 5 very elderly people left who practice this ancient craft in Vila Real in the north of Portugal. It is inscribed on the list of UNESCO Intangible Cultural Heritage. The 26 and 31 year old founders have had great support from the local community. Yet they’re not acting simply out of nostalgia – they use traditional production methods to create contemporary forms with minimal lines that would not look out of place in a New York or London loft. That’s where their industry experience helps: “We know what the market wants,” says Daniel Pera. 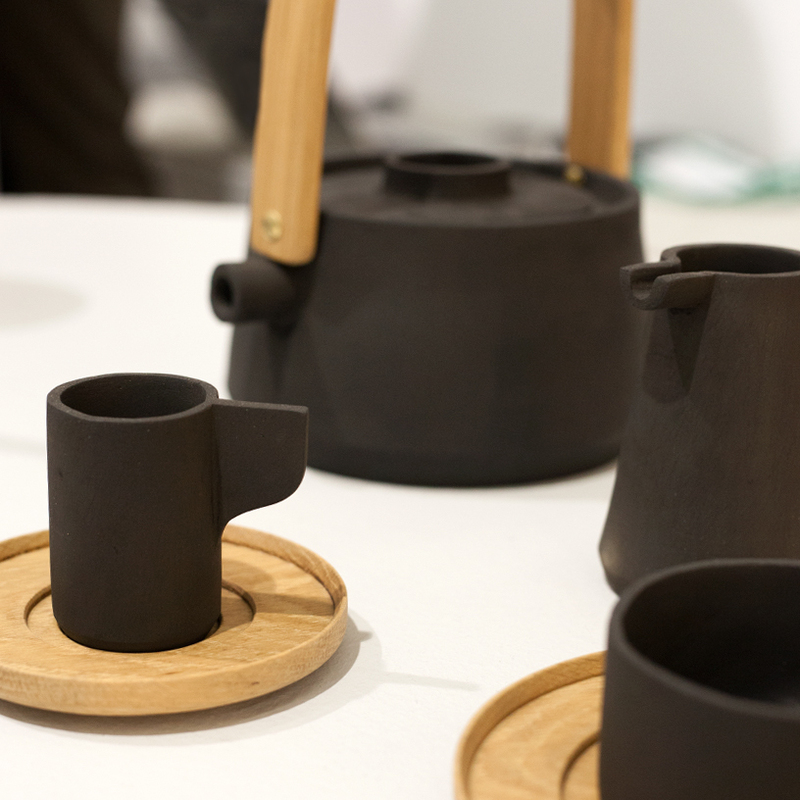 The range currently includes carafes for wine and water, tea and coffee pots, candleholders and small bowls for tapas; a wider selection of cookware is planned. In the meantime, we wish Bisarro well: Boa sorte! A cheeky little coffee cup has pushed in front of the teapot. Firing in a naked flame is not for the fainthearted. Äggcøddler also work with a long-established tradition: the British ‘egg coddler’. 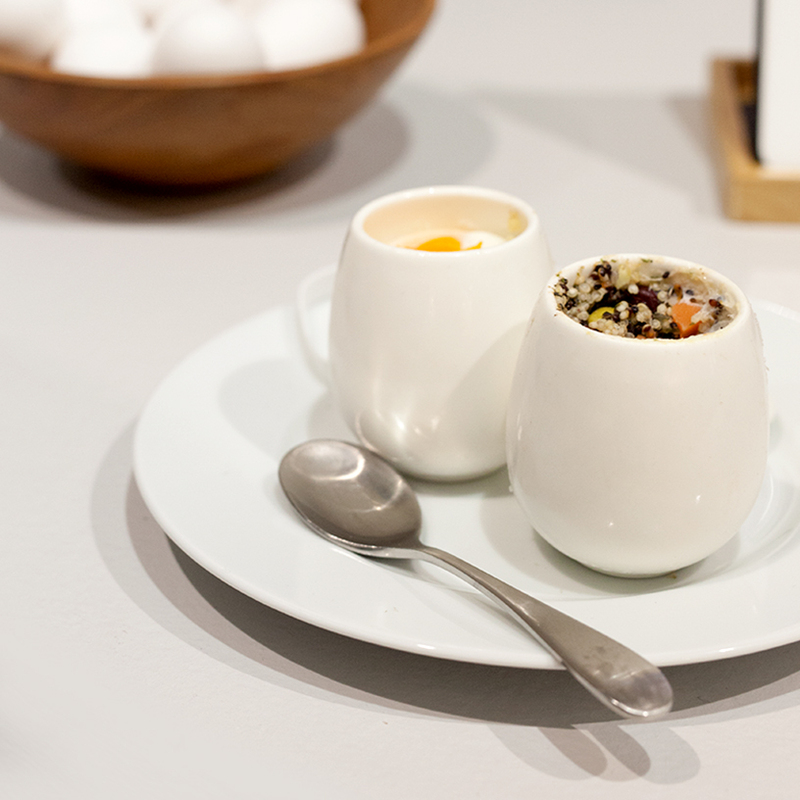 The principle is very simple: The egg is boiled in water inside a porcelain container with a lid. It can be soft or hard-boiled, on its own or with added flavours. 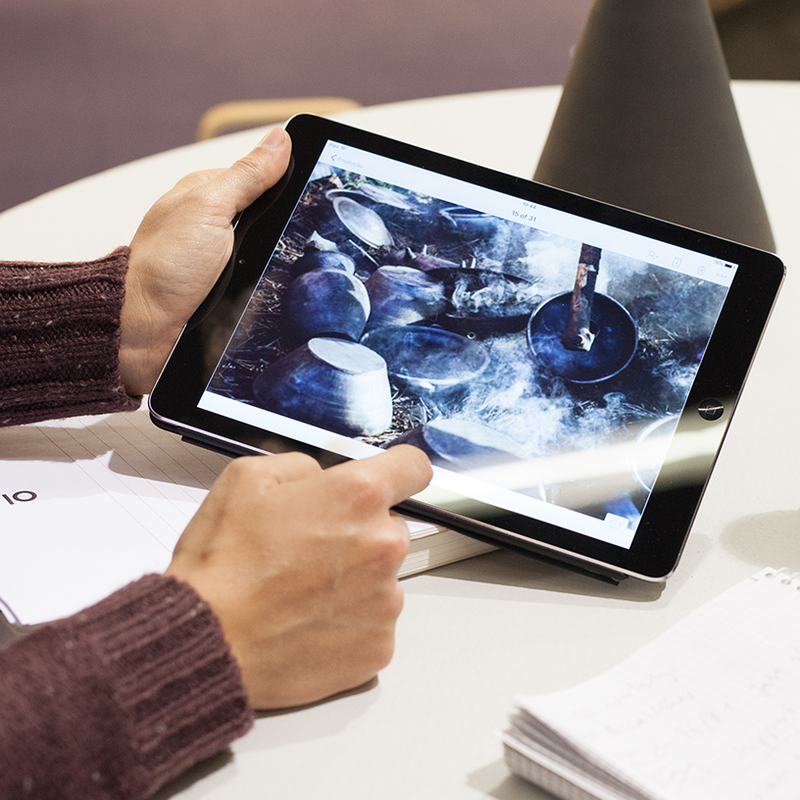 Coddler creator Jois Lundgren assures us that it’s also ideal for using up leftover food. This mercurial figure is not a product designer by profession, but studied visual communications in London and has worked for a long time as an art director. The Äggcøddler was born almost by chance – when Lundgren inherited his father’s house in Sweden, he found a traditional egg coddler there which fascinated him. Since they were no longer being made, he decided to take matters into his own hands. Lundgren took it upon himself to design a suitable porcelain container with a pastel-coloured lid, and seek out a manufacturer in China. The manufacturer also provides a small silicon ribbon that ensures the lid seals the container properly. Although each egg is only inside for 10 to 15 minutes, the Äggcøddler is so curvy and cosy that it must really feel at home. You can choose how you like your own egg, on its own or with added flavour. A traditional egg coddler next to Lundgren’s modern creation. Glass + porcelain = lovely! Karina Wendt is very familiar with a different material. 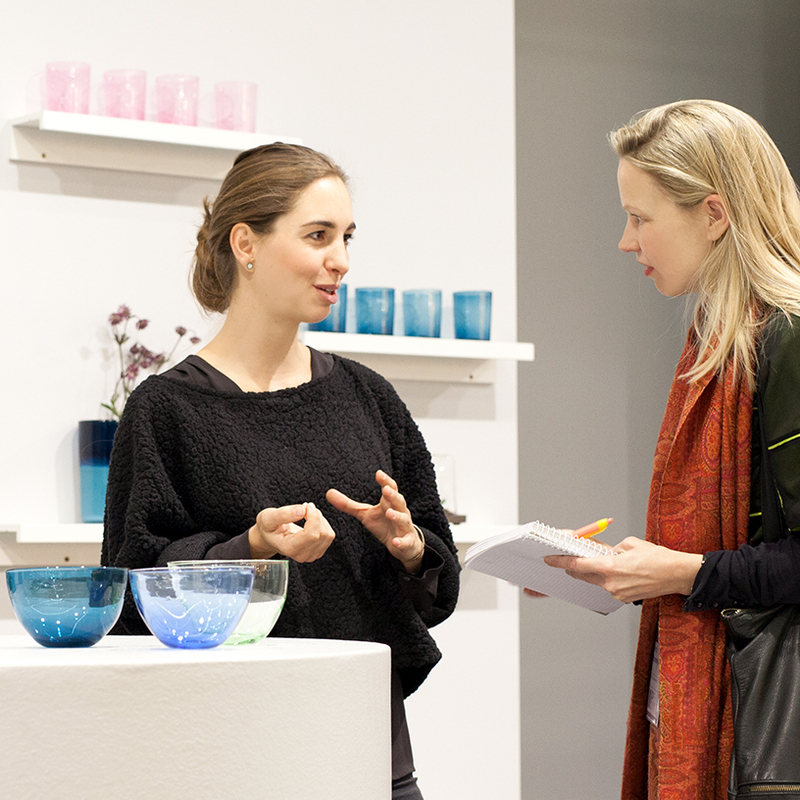 This product designer from Baruth in Brandenburg studied glass-ceramics and now designs wonderfully delicate vases, glasses and dishes. She works with manufacturers in the Berlin area who still use hand-blowing techniques. 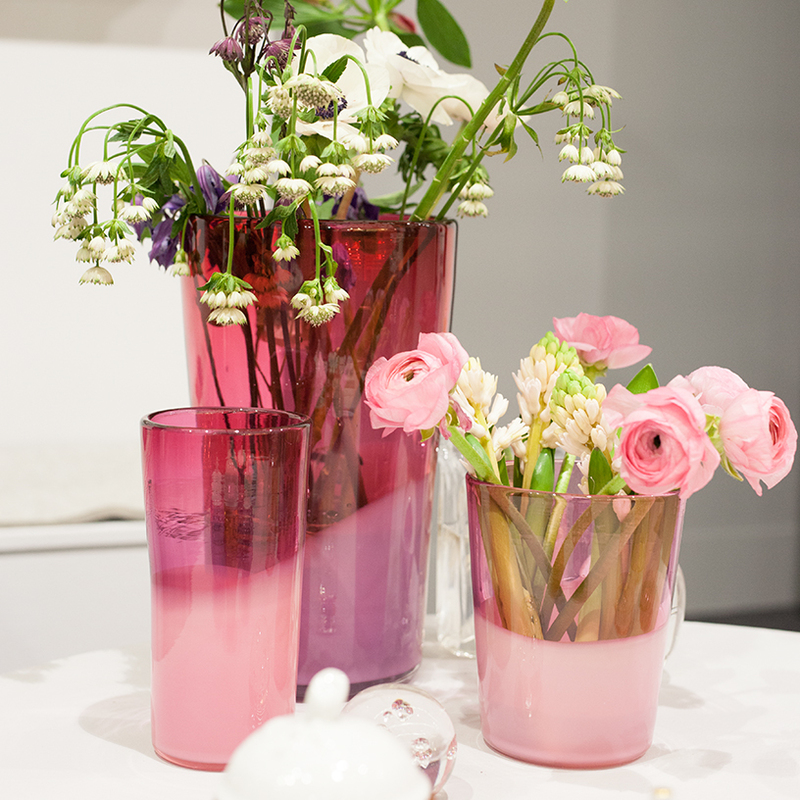 Her flower vases are stunning, with colours turning opaque towards the bottom of the vase. Wendt explains that this hides any unsightly secretions from the cut flower stems. Quite a revelation! Then there are these magical pots made of glass and porcelain. It’s an unusual combination that began when the designer’s mother broke her favourite pot. Only the small porcelain lid was left, and Wendt decided to make a new pot to fit it. 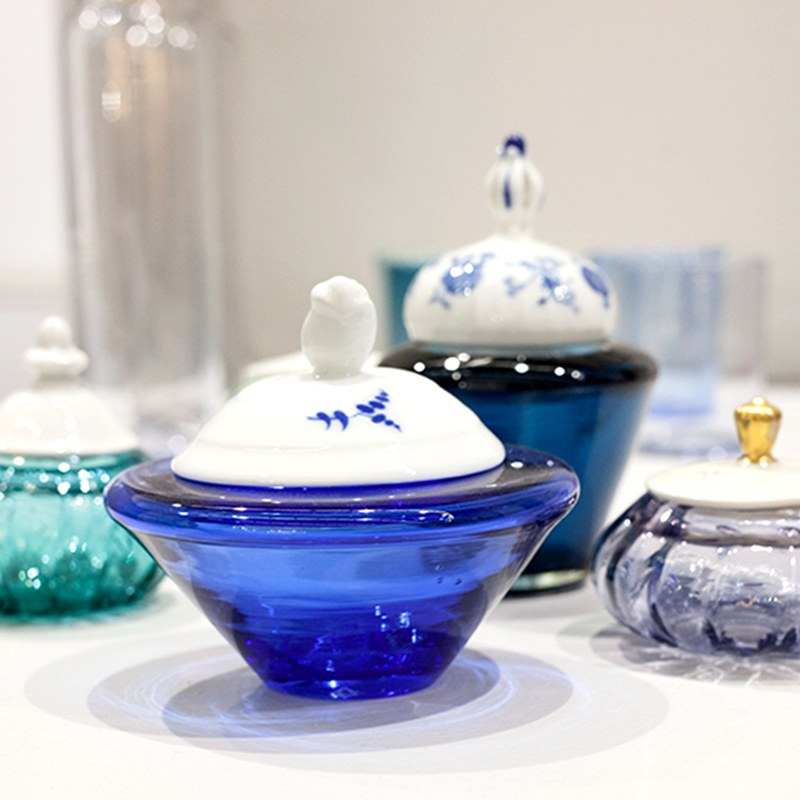 This developed into a series of unique pieces, each of which combines a porcelain lid with a hand-blown glass pot underneath. 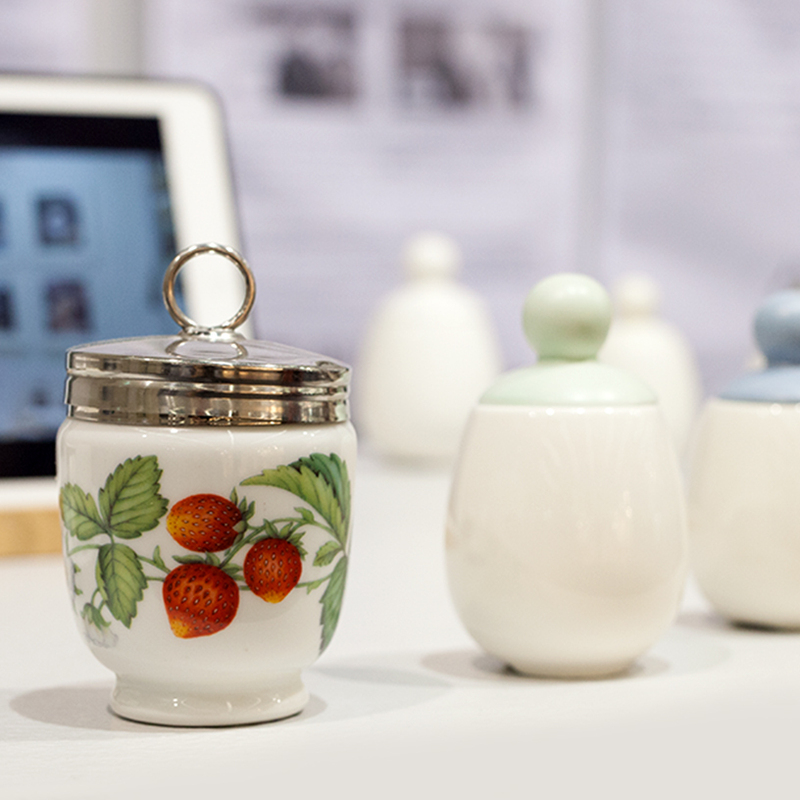 Whatever they’re used for, these pots are particularly pretty – whether as a sweet jar, salt cellar or jewellery box. Lonely porcelain lids find a fitting glass partner. 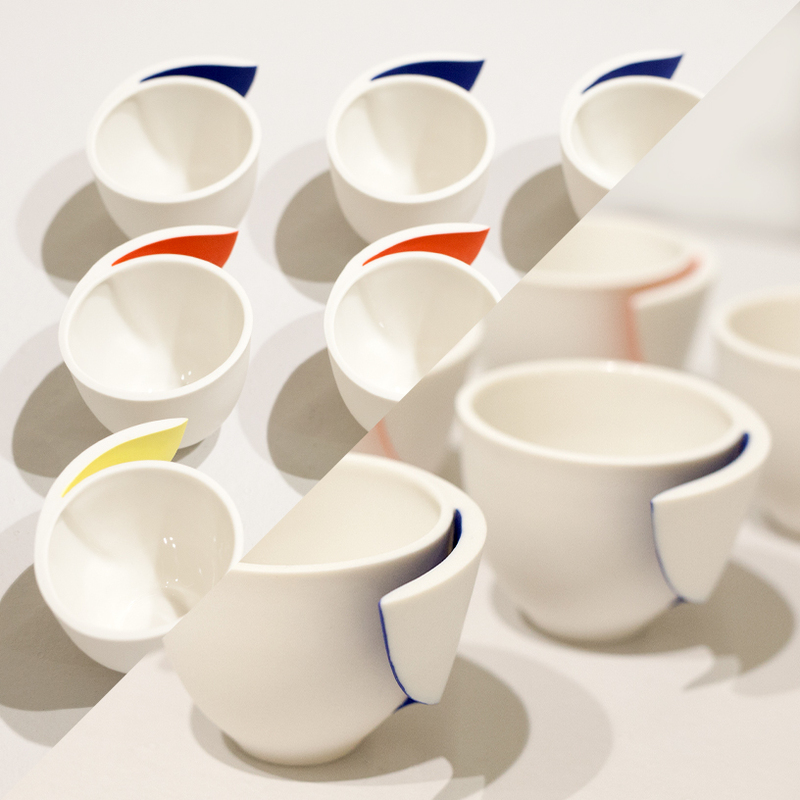 Atsushi Kitahara is a friendly, reserved young man who designs similarly understated ceramics. He studied for a first degree in Japan, working there for five years as a ceramic designer before moving to Germany for a Master’s at the Burg Giebichenstein University of Art and Design, Halle. He plays with alternating smooth surfaces, sharp angles and folds, allowing the material to develop what looks like a will of its own. For example, his vases and cups in the ‘Glimpse’ series have a small pennant that unfurls to reveal a boldly coloured interior surface. You would never guess that the entire object was originally in that primary colour, and was only later coated in white. Atsushi Kitahara references his country’s traditions: clothing used to be muted, with colour and pattern on the inside or the lining, if at all. The idea of these hidden elements and indirect reflections has inspired him to produce playful adaptations. 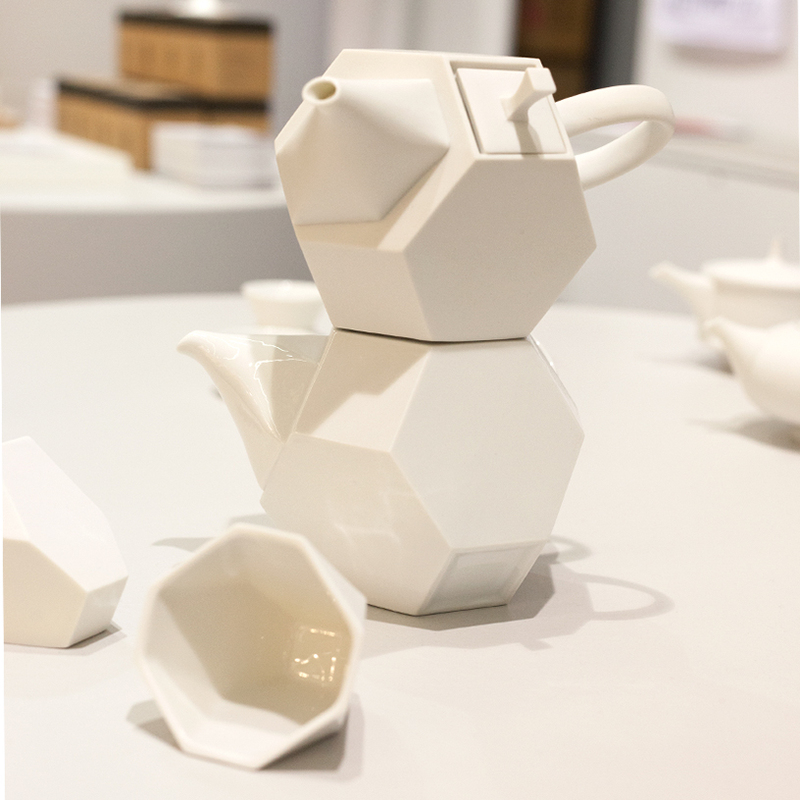 The ‘Roll’ flower vase reacts to the way florists often package bouquets, and the ‘Piece’ teapot has smooth, unglazed surfaces that invite owners to stack them together. What would the masters of the Japanese tea ceremony say? … which can be stacked nicely.